Last minute hotels and special hotel offers in Hungary! Online hotel reservation in Hungary's best hotels. Hot hotel deals - online bookings for Budapest, Balaton and the countryside. Enjoy affordable accommodation in Budapest's 3-4-5-star hotels! Save up to 75% of your travel expenses with our online booking service. Special hotel offers and wellness package offers -Best value, best prices, best holiday. The Wellness, Active and Wine Hotel Bonvino is located in Badacsonytomaj, only 300 ms from the shore of Lake Balaton, on the territory of Balaton Uplands National Park of Hungary. Hotel Bonvino Wine and Spa, opened in June 2011, is the first active and wine hotel of Hungary. This title was won due to the vicinity of Lake Balaton and the Volcano Valley of Badacsony Mountain, as this region offers numerous opportunities to excursions, tours, wine cellar visits and special programs in the terms of wine and activity. The 4-star Hunguest Hotel Bál Resort Balatonalmádi is located on the northern shore of Lake Balaton, in Balatonalmadi. The resort hotel offers 210 luxury rooms, more restaurants, convention center, own beach, Beauty Farm and Bál Wellness Club. The spectacular view of Lake Balaton is guaranteed in each room of the hotel. The four-star Anna Grand Hotel **** Wine & Vital is located on the northern shore of Lake Balaton, in the heart of the historical district of Balatonfüred. Hotel guests can choose from modern rooms and rooms reconstructed in period style. Every room has air conditioning and Internet connection. The wellness centre, created in 1200 m², awaits its visitors with modern equipment and services. Anna Grand Hotel is perfectly suitable for big conferences and various events. Hotel Annabella - located 50 meters from the shore of Lake Balaton - has 388 rooms, indoor and outdoor swimming pools and private beach. Free time activities and cultural programmes are available for the recreation of the guests. 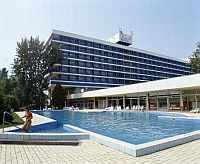 Hungary, 3-star hotels At Lake Balaton, online booking, Danubius hotels. 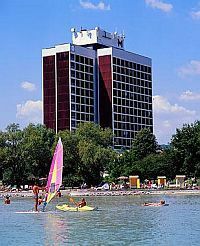 Danubius Hotel Marina is situated right on the shore of Lake Balaton with 349 well equipped rooms and 34 family apartments. The resort hotel is ideal for families with children. Hotel restaurant, private beach and swimming pool await the guests. Children animation, water sports. The 4-star Hotel Silverine Resort Balatonfured **** superior is situated directly on the shore of Lake Balaton, in Balatonfured, in the centre of the lakeside area, next to Tagore Promenade and the port. Hotel Silverine Resort Balatonfured is a wellness and conference hotel with a port of its own, with double rooms with balcony and panoramic view and de lux apartments. Hotel Silverine Resort offers a wide range of services for all who need an active rest, holiday or yachting. The brand new 4-star wellness and resort hotel, Hotel Marina-Port, is located directly on the shore of Lake Balaton, in Balatonkenese. Hotel Marina-Port offers air conditioned rooms, a fitness and wellness centre, an air-conditioned restaurant which has a terrace with a view of Lake Balaton, an open-air restaurant and an own plage with deckchairs and sunshades. Hotel Marina-Port is equipped with boats for groups. For individual guests the waterside hotel recommends sailing. 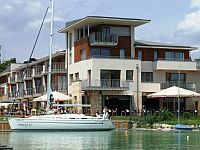 BL Bavaria Yachtclub offers its guests 31 fully equipped apartments, a sandy beach on a 30 000 m² area, underground parking places and a yacht port in Balatonlelle, directly on the shore of Lake Balaton. From BL Bavaria Apartments and the outdoor pools guests can enjoy the panoramic view of the Lake Balaton. The Yachtclub of the resort town Balatonlelle offers 160 places. In the autumn the surrounding vine-growing region provides wine tasting tours and vintage balls. BL Bavaria Yachtclub is a perfect accommodation solution for families as well, it provides children's day care, children's pools and innovative playground. The 3-star To Wellness Hotel is a romantic and elegant wellness hotel in Hungary. It is located 60 km far from Budapest, in Bank, about 15 minutes drive from Vác on the main roads number 2/a and 2. The hotel is located at the meeting point of Börzsöny and Cserhát Mountains, on the picturesque shore of Lake Bánk. Our hotel is a perfect place for those who look for a quiet and natural environment to relax near by Budapest. The hotel awaits its guests with 36 rooms, 3 conference rooms, gastronomic and wellness services. The brand new 4-star Novotel Budapest Danube hotel is located on the banks of the Danube on the Buda side of Budapest in the vicinity of Buda Castle. The hotel awaits its guests with the magnificent view of the Hungarian Parliament. The 175 Novation rooms of Novotel Budapest Danube and the hotel services, following the expectations of our age, are suitable for satisfying the requirements of both business and leisure travels. The 5-star Sofitel Budapest is located in the heart of Budapest, overlooking the river Danube, the Chain Bridge and the Castle Hill. The luxury hotel offers 350 air conditioned guest rooms and the Sofitel Executive Floor, which provides superior levels of comfort and relaxation for the business travellers. The new restaurant of the hotel, the Paris-Budapest Café offers a fusion of French, Asian, Mediterranean and Hungarian cuisine. The entrance to the Fitness Centre and the Las Vegas Casino is free of charge for hotel guests. Parking for 70 cars. The 4-star thermal hotel Danubius Hotel Gellert located in the centre of Budapest, overlooking the Danube, is waiting for the guests who are looking for a traditional Grand Hotel with classical style. The spa hotel offers various types of rooms, 24-hour secured parking, thermal bath & spa and business centre. Hungary Budapest 4 star hotels online booking. Danubius Hotel Gellert is located at the foot of Szabadsag bridge, 300 metres from the Vaci street. The 4-star hotel, totally renewed, connected with the Budapest Congress Centre, provides ideal opportunities for businessmen and tourists with a wide range of services. Meeting facilities for up to 2560 people. 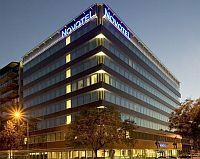 The four-star hotel Novotel Budapest Centrum, opened in August 2002, can be found in the downtown of Budapest, with easy access from the cultural and commercial parts of the capital. Indoor garage, 5 air-conditioned meeting rooms, both for businessmen and tourists. The 4-star Hotel Mercure Budapest Korona, situated in the heart of Budapest, awaits the guests with typical „Mercure” comfort and friendly atmosphere. Garage for 130 cars. 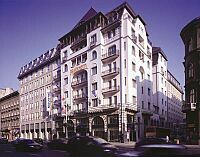 The four-star hotel Mercure Budapest Buda is situated in the business centre of Buda, in Budapest, in pleasant surroundings. The hotel offers 390 rooms, 7 meeting rooms for both tourists and businessmen. 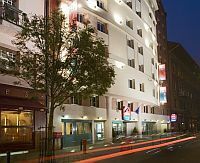 The Ibis Styles Budapest City is situated on the Pest side of Budapest, close to the city centre. 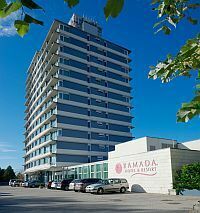 Non-smoking rooms and rooms with panoramic view to the river Danube are awaiting the guests. Ibis Styles Budapest Center is a fully renovated 3 star hotel located in the bustling city-center of Budapest. This hotel, which has 130 rooms, 2 meeting rooms and a snack bar is suitable both for business and leisure travellers. An unforgettable experience - welcoming, cosy athmosphere together with a taste of the continent's first underground with decorating symbols of the stops in the lobby and on the corridors. 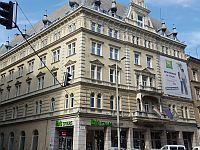 The 3-star Hotel Ibis budapest Centrum*** can be found on the Pest side of Budapest, just 5 minutes walk from the business and cultural centre of the city, with in-house garage. Excellent for businessmen and tourists.